These metrics can be very helpful in estimating the fair market value of properties when utilizing the income approach to value. 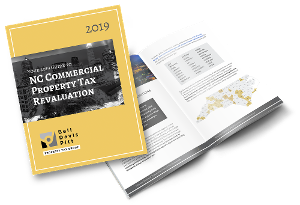 Clapp's market survey provides exactly the type of information needed for property tax appeals cases, given that case law states that, in applying the income approach, one should use market metrics, such as market rental rates and market vacancy rates, rather than the specific property metrics—actual rental rates, actual vacancy rates, etc..
Clapp's Winston-Salem Office Building Survey for July 2017, their 50th survey of a sample of major office buildings, can be viewed here. Michael Clapp & Associates in Winston Salem, appraisers that work in the Triad and across the State, periodically prepare reports broken down by property type, discussing various metrics that are useful in analyzing the fair market value of properties. These include rental rates, vacancy rates, etc. Clapp's survey of Office Properties, published in January 2017, showed that vacancies had decreased substantially and asking rents had increased slightly from the previous report. Michael Clapp & Associates, Inc. periodically publishes information regarding property values, along with related metrics, for various types of properties in the Winston-Salem/Forsyth County area.